In this video we will discuss multiple named views in angular with an example. 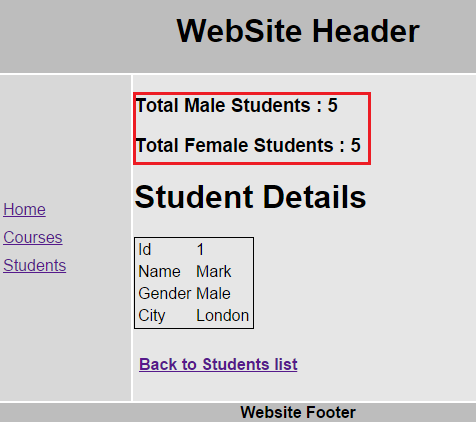 Grand Total should not be displayed on studentDetails page. Step 1 : Modify HTML in studentParent.html as shown below. 1. Comment or delete the line that displays Grand Total. 2. Include 2 ui-view elements and provide a meaningful name. The ui-view element that is named "totalData" is responsible for displaying Grand Total. 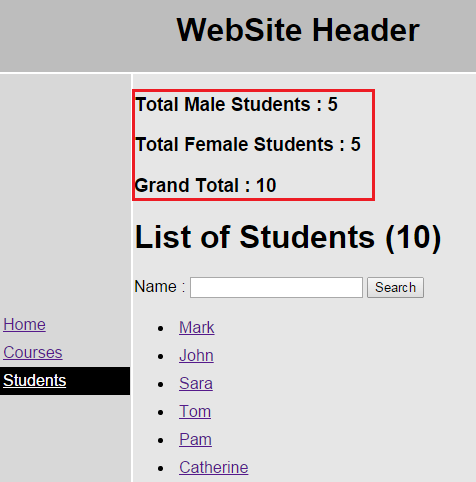 The ui-view element that is named "studentData" is responsible for displaying students list or student details depending on which page you are viewing. "studentsTotalController" function and "studentsTotal.html" template file are not created yet. We will do that in Step 3. Step 3 : In script.js, create "studentsTotalController" function. The resolved dependency "studentTotals" from the parent state is injected into the controller function. The "total" property of "studentTotals" is then used as the value for this.total, which will be used by the view to display Grand Total. Step 4 : Add a new html file to Templates folder. Name it studentsTotal.html. All we do here is display grand total using an h3 element. Step 5 : In script.js modify "studentParent.studentDetails" state as shown below. Notice here we are using only one of the named views i.e "studentData". "studentDetailsController" function and "studentDetails.html" template file will be used to generate content for "studentData" view. Since we do not want to display Grand Total, we are not using the other named view i.e "totalData". You are doing a great job.I have learned a lot from your vides and tutorials and still learning new ideas. Kindly give me the chance to help you by any means in technology. If possible then make video on AngularJS CRUD operation using Modal Dialogue. Means when user click on Add or Edit it popup the form. Furhter user can upload image or doc file without submit the form when file is uploaded then user can submit the form. Also make videos on client side and server side validation in AngularJS. Sub --" Problem in Name updating but i dont want to update image "
while updating your model , make sure that the particular property for IMAGE is marked as followed. I moved the resolve statement out of the views "studentData" and put it back up under the url: "/", statement. Worked great. Hi Mr. Kudvenkat, I am a fan of your videos. I am using ui-router v1.0.3, and I got the same error as Hector Lamar. Could you tell me what did I do wrong? I'm using PHP so the $http.get is a little different. Also some property names are a bit different. What do you think Kudvenkat?